A baby skin is chooooo soft and instantly absorbs everything you put on it. Babies, these days are not safe from chemicals. But, using all natural baby products is a good step. This list of Best Safe, Natural and Organic Baby Lotions in India will help you find the best baby lotion for your newborn baby. Indians have traditionally relied on natural products for baby care. Mustard oil for maslish, malai and besan (milk cream and gram flour) for ubtan, and almond oil or coconut oil for hair. All major brands of personal or baby care products are a cocktail of parabens and phthalates or SLS and silicones. Most of these chemical free baby lotions are available online on different stores. Almost all good brands now come paraben free. Rustic Art claims its products are free of all the added fragrances and colours. What I like best is that the products are all handmade. Their baby lotion contains all natural and organic ingredients – Aloevera, Olive Oil, Almond Oil, Grape Seed Oil, Sesame Oil, Shea Butter, Glycerine, Rosé Wax, Vitamin E, Jojoba Oil, De-ionized Water and Natural Preservative of TLC. Rustic Art is really an amazing eco friendly brand. We also love their baby coconut oil soap and Little Laundry detergent. Their products are good but little expensive. 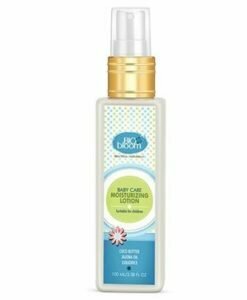 BioBloom Baby lotion claims to be free from parabens and added fragrances. 95% natural ingredients have been used to make their products. They are still working on getting organic certified ingredients. Biotique also claims to be a brand using 100% natural botanicals and recyclable packaging. Their Baby Biotique Lotion comes in a 190 ml pack for Rs193. This is a very good price point considering that natural and organic ingredients are not cheap. In case your baby has any skin problems, please consult your doctor before trying any new baby lotions or products. Well, that was my honest review of the baby lotions I have used so far! Now, over to you! Have you tried any of these brands, if so, which are the ones you trust? Which is your favorite brand of baby lotion in India? Do share in comments!